Spinach – Lentil curry with ground coconut. I had the privilege to enjoy fresh home made lunch for about a month when my parents visited me last summer. I would impatiently wait for the clock to tick 12 to rush home to savour the mom-made lunch. No, 12’O clock is never too early for lunch especially when it’s cooked by mommie dearest. It was during one of those merrier days I had this curry that tasted very similar to my old favourite “Paruppu curry” but greener in appearance. I was told that it was “cheera paruppu curry” , translates to spinach lentil curry, and it featured often in our menu (!) during my growing up years in Kerala. I am not too sure about this claim and didn’t bother to care much as I was too busy wiping off every bit of the curry left on my plate. Now lets move to the apparently not so new spinach with mung daal curry. Cook the Mung Daal in a regular pan or pressure cooker with the chilli powder, turmeric powder and enough water to cover. While Daal is being cooked , grind all the ingredients listed under the “To grind” section to a fine paste. Sauté the finely chopped spinach until it’s wilted. Once the Daal is soft add the spinach, salt and coconut paste to the Daal and cook for another 5-6 minutes. Remove from the heat. 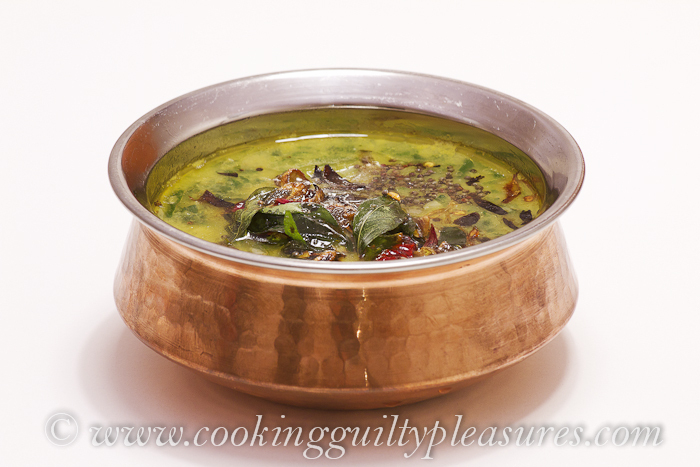 In a small frying pan, heat oil/ghee and add the mustard seeds. When it starts to splutter, add the rest of the seasoning ingredients and fry until the shallots are browned. Pour this over the curry and leave it covered till it is served. My mom adds thinly sliced shallots to most of the seasoning and I can vouch that it definitely enhances the taste. This tastes great when served with rice alongside an accompaniment of fried pappads and lime pickle.